My pic I took of Bowie Baysox Mascot “Louie” appeared in Tuesdays B Free Daily Paper. Here is the link to see the paper online, please click on to page 4 to see my Louie pic. Link is http://www.readoz.com/publication/read?i=1026281&letter=B I was very pleased with the “Family Product” that the Baysox offer. I now am 100% behind this organization. I have to admit, despite being a 35 year old man lol, I thought Louie was cool lol! I was also very happy that B printed a pic, this is great publicity for the entire Bowie Baysox organization! 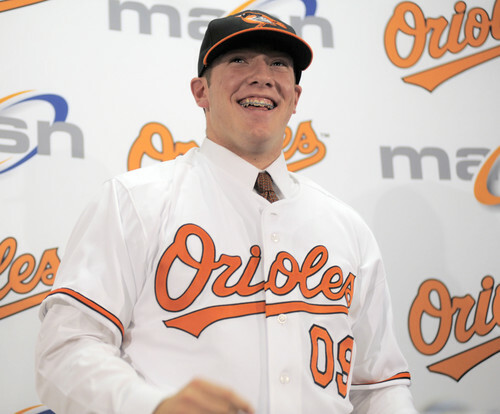 Will Anthony Ranaudo be the O’s 2010 1st Round Selection? MLB Power Agent, Scott Boras already has this 99MPH flame thrower under contract. And in the upcoming MLB Draft, he is predicted to fall to the O’s with the 3rd Overall Selection. The Orioles need some bats, but its looks like Ranaudo and his 99 MPH Bat-Breaker are TOO valuable to pass up on. People have already compared him to O’s Brian Matusz by his command. Several scouts believe the talented Ranaudo will at tops be in the minor leagues for 1 year, since they feel he is already MLB worthy. Trembley Still O’s Manager….But Remains in Hot-Seat! Dave Trembley has “SURVIVED” better than Rupert or Russel Hantz! But how long can Trembley remain as the skipper, on the O’s sinking island of misfit players? McPhail has been almost meeting on a daily basis with O’s owner Peter Angelos, and things dont look good for Trembley. At this point, I think its almost useless for the nerdy McPahil to act like Donald Trump and tell the skipper”Your Fired”! 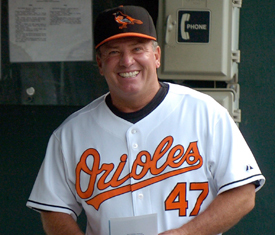 Unless the O’s have a skipper who would sell tickets aand bring back “The Oriole Way” by bringing in a Cal or Billy Ripken or maybe even a Rick Dempsy type manager, then I dont see the use of making one of the O’s reject bench coaches Interm Manager! After all the O’s currently stand to recieve the 1st Overall Draft Pick in the next years Baseball Amatuer Draft. I say “Keep Losing” so we can draft a player who WILL make a impact in “BirdLand” in the next couple of season. Trembley is TOO NICE of a guy to be skipper. The O’s players have abused him, and have done everything BUT earplugs in there ears when he speaks to them. Trembley is a nice guy, but in the MLB…..Nice Guys Finish Last!! 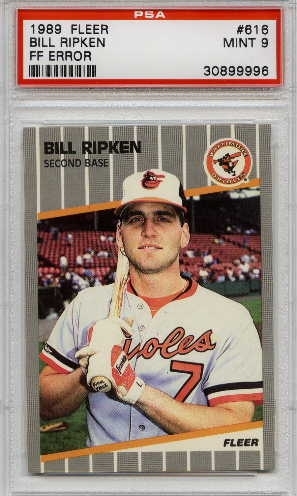 Who Wrote FF On Bill Ripken’s infamous 1989 Fleer Card? In 1989, Orioles 2nd baseman, and Cal Ripken brother, Bill Ripken became famous for the ERROR baseball card, that had all of America laughing! According to many reports, Bill Ripken wasnt safe no where, and almost got into a couple of bareknuckel fist fights, because people would call him FF(And no lol, FF does not mean Friends Forever!). Today this card is still one of the baseball card industries biggest mysteries! Ya dont need to call Robert Stack at Unsolved Mysteries lol, I did my own internet investigation! For years many thought it was one of the O’s players. After all Bill Ripken was known as a “Hot Head” who got his way because he was brothers with the Milkman Cal Ripken, and his dad was O’s manager for some good time. I dont think Fleer wrote FF on the bottom of his (Non-hitting) barrell of worthless bat! BUT yes, they seen the FF before the printed cards. After all, they had 6 proof readers, who all had to check the card for a ERROR. Either the proof readers didnt do there job(ERROR cards were at a all-time high in late 80’s early 90’s) or they were drunk, or Fleer let it go by, in order to create buzz for the card. I believe the players got back, at the team jerk! The guy nobody could stand in the locker room! Bill Ripken to many of his teammates….may have been a FF! And on this day(1989 Fleer photo day) his teammates got paybacks! In the end Bill Ripken ended up as the JOKE of America lol! Glenn Davis…..and the BarFight That Ruined His Career! I still to this day remember where I was at, the moment the O’s traded for what looked like the trade of the century, when they traded for Houston Astro’s All-Star Powerhitter Glenn Davis. Today it is considered by many as the worst trade in franchise history. 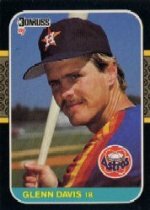 In 1991, when he was traded to the Orioles from the Astros in exchange for Steve Finley, Pete Harnisch, and Curt Schilling. Schilling went on to become among the best pitchers in baseball, Finley was a two-time All-Star and five-time Gold Glove recipient, and even Harnisch had two 16-win seasons after leaving Baltimore. Davis was a Class-Act….cough…1st Class-Jerk. I remember being a 16 year old with his dad, we were die-hard O’s fans. We waited after the game, in hope of getting the O’s newest sluggers autograph in the parking lot of Memorial Stadium. In the old days, players would be forced to park near the fans cars. Davis was the 1st person I ever seen to have a SUV. Back then, they were only a Texas type ride. Davis got a attitude when a group of fans(including me and my dad) asked for his autograph. It became clear to me at that point, he was pissed he was traded to the Orioles. Davis told us to”Get out of my F*ckin Way”. I never at that point had heard a player cuss at his own fans. What a *sshole I thought. Glenn Davis and his pissy attitude would NOT fare well in Charm City. After only ONE week of coming here in the worst trade ever, he would have his jaw broke in a bar room brawl. The guy who broke his jaw, was a local teamsters member, who was a local boxer. Davis according to reports, started beef with him, because he thought he cut him off to get up front to place his order at the bar. Davis told him to “Get behind me, or I will break your nose”. The local boxer popped Davis with a HomeRun bareknuckel punch, sending Davis and his all-most guaranteed Hall Of Fame Career to a smashing BOOM! Davis would have a broken jaw. A week later on the news, the boxer even said he told Davis”He would break that jaw, so he cant use that filthy mouth of his” and he backed it up lol! Davis had a wired jaw, and had to drink through a straw for 12 weeks. Glenn Davis…yeah he was the hotshot with the filthy mouth to Baltimore fans. After only one week….he was shut up….Baltimore style lol! This baseball card may be the only time you see wasted #1 Draft Pick Billy Rowell in a O’s uniform. Drafted as the 9th overall pick in the 2009 Amatuer Draft, Rowell was once considered the air-apparent to Melvin Mora. Well some 4 years later, the power hitting 3rd baseman, is still in Frederick, filthy rich from his 2.1 million dollar signing bonus(wasted money). In 4 damn years this kid hasnt even made it to Bowie to see Louie(the lovable mascot). With 3rd base prospect Bell ready to crack the O’s roster, Rowell will become just another overpaid prospect, riding the minor league bus. This is the problem with the O’s organization. Scouts have NOT done there job. Remember Adam Lowen? High Draft Picks with nothing in return. Hang in there O’s Fans…Things WILL Get Better! Yeah right now, things are looking very bad for the Orioles. But within 2 years the Orioles in my opinion will have perhaps one of the best pitching rotations in baseball. And the man who will be the ACE will be Matt Hobgood! Hobgood is just one of those natural athletes. He is similar to O’s Nick Markasis. He was both a All-Star hitter/pitcher. 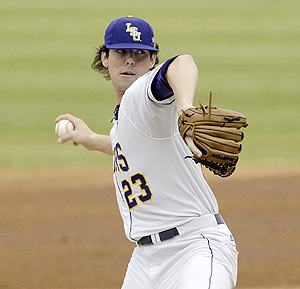 Right now he is only 2-3 with a 4.97 era, but things will get good for this flame thrower. Hobgood did a Babe Ruth move, that is still talked about to this day. In his last high school at-bat, Hobgood pointed for the fences. Wanting to go out with a bang, he did just that, by slamming a estimated 450 foot homer after calling his shot. Hobgood has the cockiness needed to be good. Often bragging and boasting, Hobgood can back up his smack talk.